Light up the night with this woodlands-inspired tealight trough. 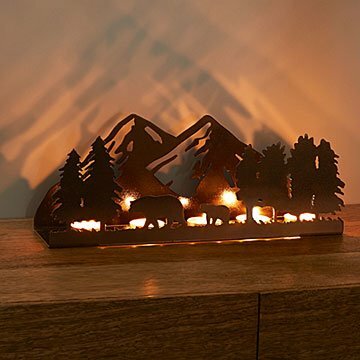 Light up the night with this woodlands-inspired tealight trough. Cast in metal and ornately designed, its soothing nature scenes cut striking silhouettes, sending mountains and trees and bears (oh my!) flittering across the walls. Handmade by Eric Gross in Kentucky. Eric Gross grew up on a small family farm, where there always seemed to be some piece of equipment in need of maintenance or repair. He developed the basic skills of metal working from his father and grandfather, spending countless hours in their old white barn, watching them work. Eric chose to study mechanical engineering in college, hoping to put his knowledge of materials and machinery to good use. He eventually grew bored of designing widgets and decided to use his metalworking skills and equipment to create original, whimsical, and functional items for the home. Read the Q&A with Eric on our blog. It is great for ambiance. Sturdy, and detailed. A great piece for any house. This tea light holder is exactly as shown. I was worried it wouldn't look as good at another angle, but it really does look nice. Very nice item , looks great . I suggest using battery operated flickering teal lights , no mess, no clean up and, safe . It gives a warm glow when the candles are burning, is very unique, reasonable price. My friends and i love it! A perfect "Thank you" and memory. have not used it yet. sturdy. beautifully designed. Was a gift and they loved it! This was a gift for family and they really like it! Great product - matches other similar designs in our home.